Jockey Noh Senari, elevated to the senior ranks this season after a fruitful comeback last year, booted home three winners from six rides at Kranji here tonight to lead the table with six wins. Noh enjoyed a splendid start to the season when he booted home a double on New Year's Day. Noh teamed up with trainer Saimee Jumaat, who took the lad under his wings last year, to land the first win tonight on GANGNAM CLASSIC in an Open Maiden event over 1400m. The was the first win in 22 starts for the Irish gelding by Dream Ahead who held on to win by a nose in a photo finish. Noh's second winner MY FRIENDS had an easier time, winning by one length in the other Open Maiden event. It was the gelding's first win in six runs. Noh then teamed up with Steven Burridge to score an easy win on GAIN ECLIPSE in a Kranji Staked D event over 1200m. 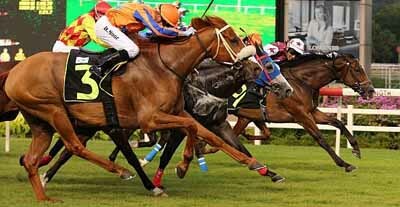 The mare won her only run in Malaysia before coming over to Singapore where she had now picked up two wins in seven outings.